You saw the before, and now here's the after. 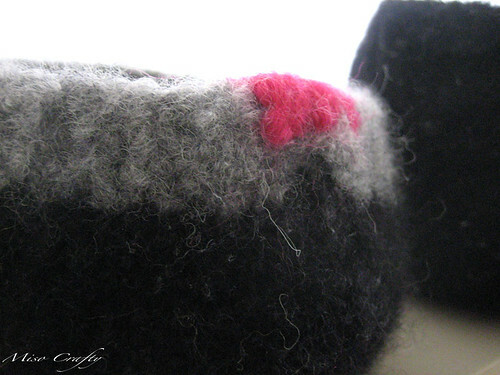 As in after they were felted! 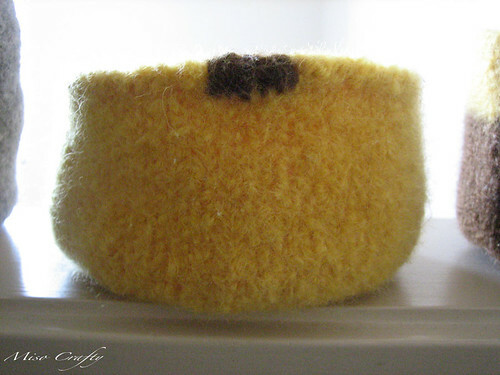 In case you haven't figured it out, they're felted bowls! I tried to make some of them nesting (these aren't nesting cause I wanted to show what the "set" looked like). They do fit quite nicely in the nested position, but I should have made the brown with the yellow top a little shorter in height so that they would be flush at the top when it's in the yellow one. Oh well. I kinda like the different heights and the fact that they make for an interesting look when used as one. I also made some straight up plain. 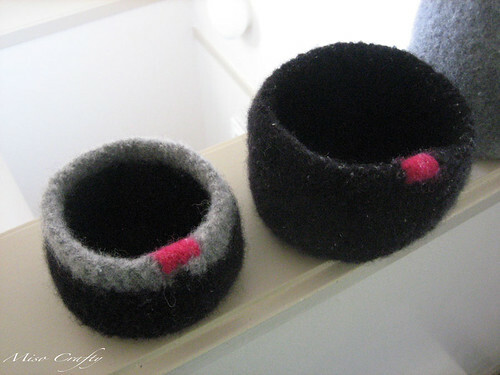 I used left over hot pink yarn on the black and grey bowls (of course I would! 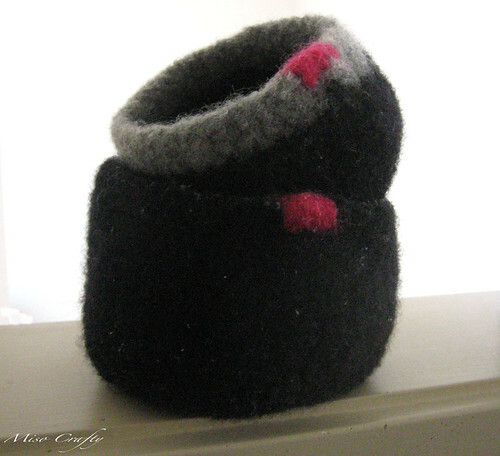 ), and then some extra black yarn on the large grey bowl. I didn't think the hot pink would look too hot (no pun intended!) on the yellow bowls, so I used a complementary color, and that was brown. I can't remember the last time I felted anything in the washing machine, most likely the first or second year of school when I had to take a textile science class. I used 2 extra large lingerie laundry bags to prevent any damage to the machine. For those of you who have never felted by washing machine before, I highly recommend the laundry bags or even old pillow cases. Even if what you are felting is small. During the felting/agitating process, matted pieces of wool can (and will) separate from your project and depending on how big they are or if they'll clump up into a big ball of crap, it can potentially damage your machine or the water hose, or worse - both. 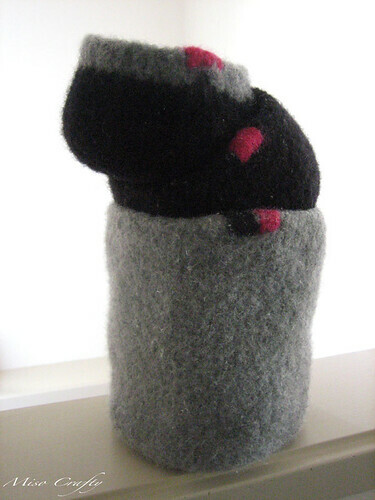 By encasing your felt project in a bag of sorts you can minimize or even eliminate that issue. Anyways, I had set my machine to the lowest water level and on the heavy duty wash cycle and kept an eye on the machine so that when it was done with the first agitation (before the rinse cycle) I was able reset it so that it would agitate again. I contemplated doing a third round, but decided to nix that idea cause I had thrown in a pair of old jeans to help with the agitation process. When it was all done, voilà! 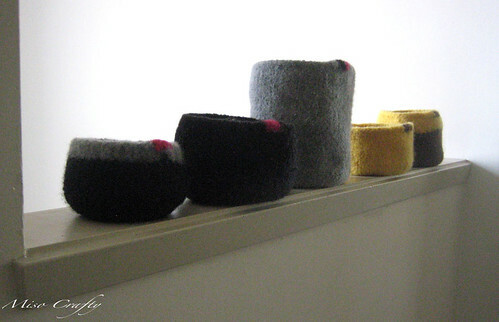 Felted bowls! Unfortunately I forgot to clean the machine before I did the felting since I had washed a load of towels the day before, so now there's a bunch of lint on my finished items. Oh well. Live and learn. Once out of the washing machine I "molded" my bowls into shape and had set them to dry along the ledge of our upstairs hallway - out of the little one's reach! For the black and grey bowls I used left over yarn from previous projects, that yarn I believe, is Patons Classic Wool Merino. 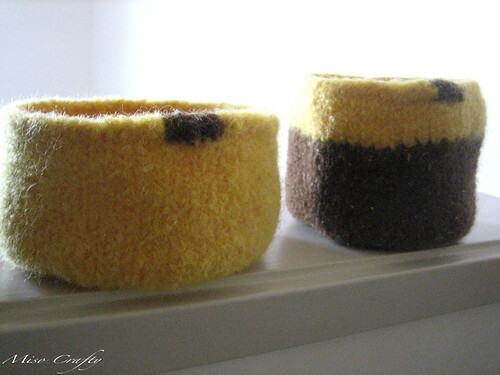 These bowls felted beautifully! I highly recommend this yarn for felting. I double stranded the yarn too and this made for nice and thick bowls. I'm really happy and excited with how these turned out and am now contemplating making some more to give as gifts. Possibly Christmas gifts?? As I've said in the last post, I'm hoping to use these for decorative purposes and to help keep things neat and tidy around here. Ok...mainly for Brett to have something to throw his loose change into. That boy seriously likes to clutter the top of our entertainment unit, our dresser, the desk, the front hallway counter...anything that has a surface basically, with piles of pennies and nickels. It's a bad habit of his that he has yet to kick. And with a crawling and curious baby roaming around, he needs to either kick that habit or at least tame it. So my game plan is to put these where he usually chucks his coinage (I like to make up words!) and hope that maybe one day he'll get his pocket shrapnel in one of these babies! Here's to hoping! I'm also thinking of making a few in blue and brown to match the little one's bedroom. I think a few of these along his bedroom window sill would look really cute and when he's a little older he'll have them to put crayons and other small finds in them. Very cool! I could use a few of those in my sewing room to put little bits and pieces in. I have never felted before. Was it easy? Hey Melissa I have tagged you to play a game on my blog. I hope you can play along. Kat - Felting is super easy. Even more so when you have your own washer and dryer (I've tried going to a laundry mat but you can't control the cycles and how many times you can do the agitation cycle). The best part? 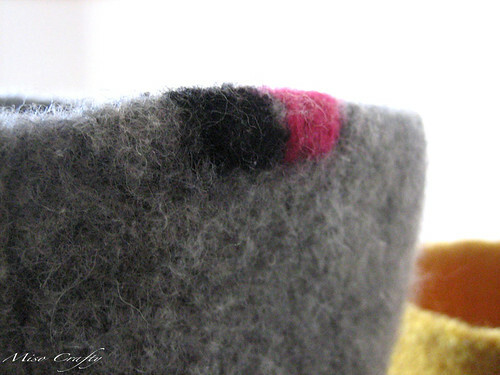 All mistakes made during the knitting are erased once felted! Natalie - Thanks Dude! I think these bowls will be my go-to projects when I have left over wool...which could be dangerous!